Looking at the title, it would have been more appealing if the challenge was to eat cake.. :) I love cake. And just about anything sweet. I really have to work at making sure I don't dig into everything that sounds de-lish to eat! So, what is this eat cake I talk about? Well, it's another week playing along with Your Next Stamp's weekly sketch and color challenge! I decided this week to use the colors and use the sketch in a very loose way. 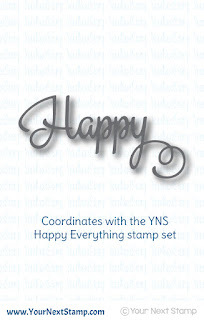 The set I have used for the card is the newly released Happy Everything, along with the coordinating 'Happy' die. The patterned paper used is from MME and I cut the bottom portion using the new scallop star edge die. 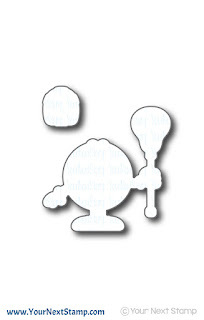 The dotted strip was made using the also newly released tiny dot edge stamp. Once those were put into place, I cut out the 'happy' with some thin, self adhesive, glitter foam. I of course couldn't leave it at just that, and when I placed on the front, I went over it with some Glossy Accents for added texture. I then added a dot of it in the center of the flowers on the patterned paper. The card was completed by adding some matte gumdrops in Spring Grass. Be sure to stop by the YNS Blog to see all the beautiful creations the DT have made. Thanks for stopping by and hope to see your incredible projects uploaded on the YNS Challenge Blog! This week, the design team with Your Next Stamp is featuring fun summer projects that you can make with all the fabulous products YNS has to offer! Today I am happy to share with you a fun summer project that could be a perfect end of the school year treat for the littles. 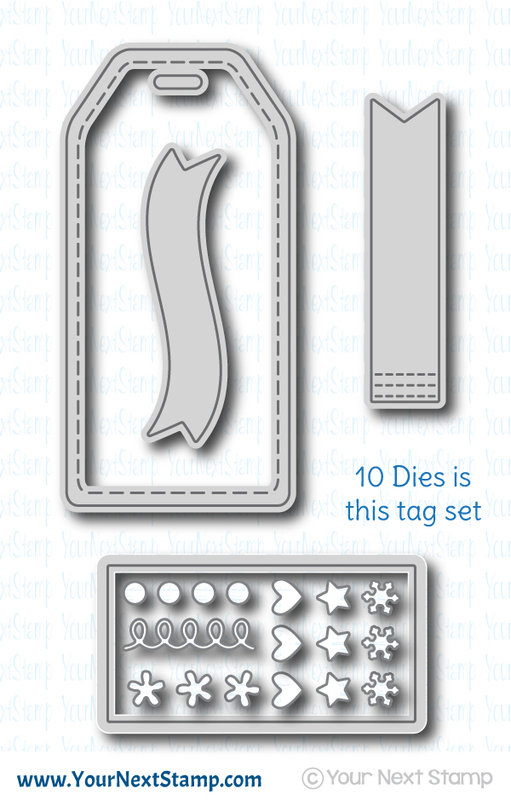 Using the YNS large banner die and the large piercing banner, I cut out 8 banners to create the word 'Summer' along with the ends that hold some fun popsicle cut outs from the Cool and Sweet set. For the center of the banner, I used the new Doily Trio set released just this month to pop up with the felt letter in the center. The letter are just self adhesive letters I found in the dollar bin at Target. 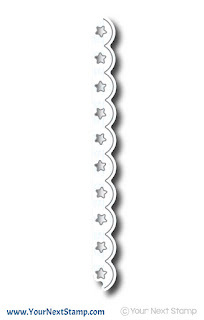 A fun coordinating ribbon color was used to adhere the banner die cuts to and this made a large banner you can hang from a banister, doorway, or even the wall to celebrate the warm season. A closer look of the banner. In addition to the banner, I also made some fun banners to add to some paper straws using the new released Cool Tag stamp and die sets. Each straw has a positive, fun saying to keep everyone smiling. Of course, the candy filled jar that holds the straws probably would make the smiles bigger. The treat bags are just some fun decorated bags that can be filled with treats. This was decorated using the Cool and Sweet set as well. 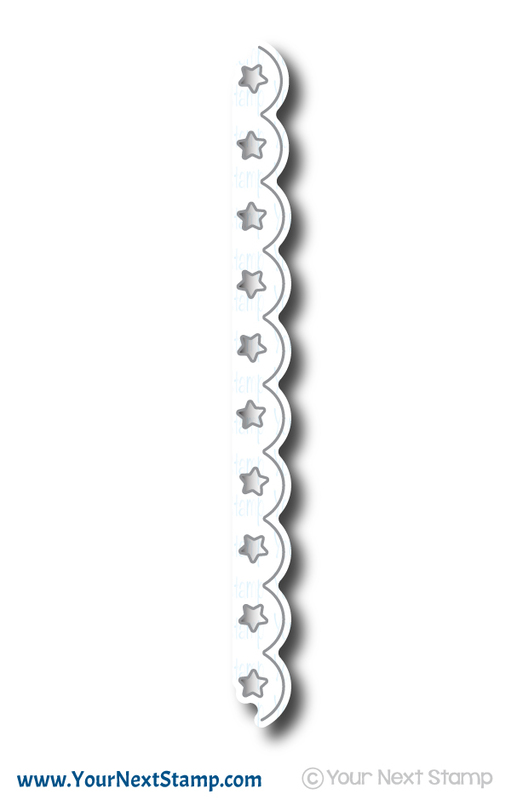 To continue with the Cool and Sweet spotlight, I thought it would fun to make a streamer using the popsicle cut outs using the coordinating die set and "sandwich" them with a thin ribbon. I hope you enjoyed the summer idea I had using various YNS products that are available for your crafting mojo for DYI projects! Thanks so much for stopping by and to see all the fun DT projects, be sure to stop by the YNS Blog! Have a great day! Have you had a chance to play along in the TCPTUES316 challenge? You still have a week to play along and link up your project for a chance to win and the theme is perfect for all this warm weather we are having. The theme is Summer and The Cat's Pajamas Stamps have so many perfect sets to create your summer lovin' project! For my card, I am using the set Lemons which is one of my absolute favorite sets in the store. I paired this cutie up with the fun die set of County Fair. I started with water-coloring the background for sky before adding the County Fair frame over it. The image was stamped and colored in with Copics before being fussy cut out and popped up in the frame. The stitched clouds die was used to for the one cloud also popped up with the sentiment stamped directly onto the background. The finished sentiment was stamped on the inside which says, 'I am here to offer you unsolicited advice and criticism.' : ) I just love it! Be sure to stop by the TCP Blog to see all the Kitty Cat Packs awesome creations and don't forget to play along and link up! We can't wait to see what you come up with. Thanks so much for stopping by and have a great Tuesday! The wait is finally over! It is time for the June new release with Your Next Stamp and Blog Hop! 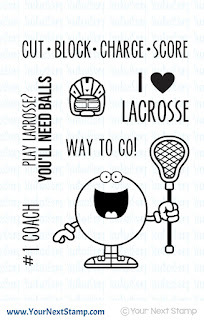 As I mentioned yesterday, I was thrilled to see a new sport fanatic set released for a sport my son plays for and is hard to find a stamp for it. That sport is Lacrosse!! This set is so much fun and the sentiments are awesome. While coloring this little guy up, I wanted to color him in all the colors my son wears for the sport and he had a great time "consulting" me on what to color where. 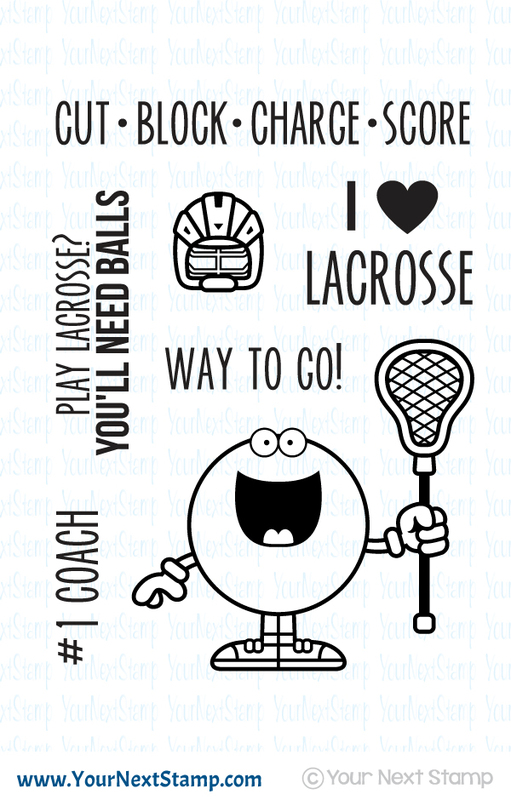 :) This set is called Sports Fanatics - Lacrosse and it also has a coordinating die set sold separately. Just to give you a visual of my son's crazy color choices in gear, here is a picture of him playing. There is no doubt we are able to see him on the field. For this card, I used the YNS Chunky Grass die for the bottom and stamped and cut out the image using the die to pop up over the grass. 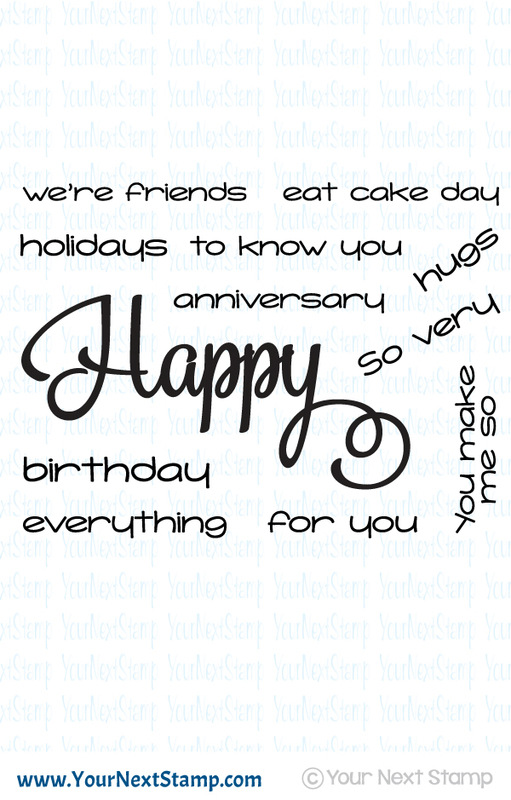 For the background sentiment, I stamped the words repeatedly to place behind the image. 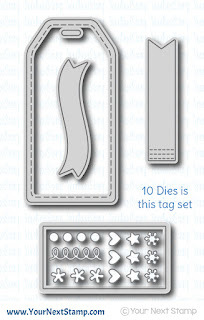 The sentiment was stamped on the die cut out from the new Cool Tags 3 die set to also be popped up. It was completed with a few of the new matte gumdrops. My next card is one using the new set of Fishy Fun. Another super fun, summery set, also perfect for cards to made for my FIL. With this set, I couldn't resist using water colors for the background and coloring in the images. Distress inks and my Sai watercolor pens were used. I just love the sentiment I used that is in the set as it is perfect! I say hello in this way at times with friends, so it will be a used sentiment for sure! Ranger watercolor paper and distress inks were used to create the water background before stamping the images on top. Once the ink dried, I went over it with more watercolors and finished it off with some Glossy Accents, my Wink of Stella pen for a little sparkle, and more matte gumdrops. Thanks so much for hopping in and have a great weekend! How do you start off a great weekend? 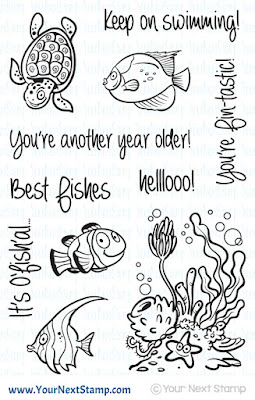 Check out all the sneak peeks for the June release of Your Next Stamp! I am super excited about this release because another Sport Fanatics set is being released and it one of a sport difficult to find a stamp of. A sport my son plays and I've been needing such a set. 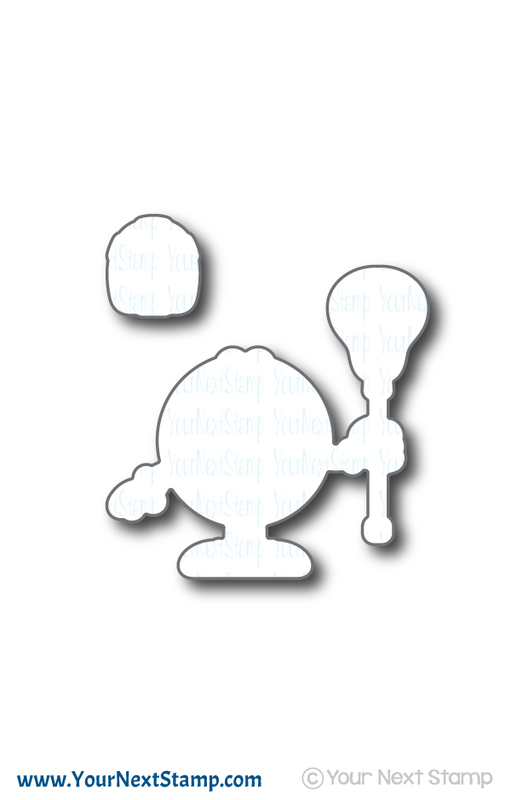 Also releasing are some awesome MATTE gumdrops! How cool is that?! But...my sneaky peek is not this sport set, (you will have to check out the release tomorrow...) but one called Happy Everything. 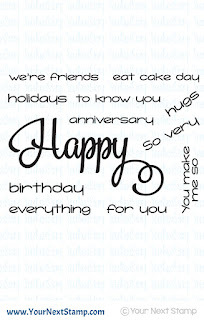 Using all the fun soon to be released die, I created this tag birthday card full of color and elements. The patterned paper is from MME. The card was complete with the new matte gumdrops and some ribbon. Be sure to stop by the YNS Blog to see all the fun sneaks and don't forget to join us tomorrow the new release blog hop! Thanks for stopping by! And that means there is still time to play along in the YNS color and/or sketch challenge! There are many options with this sketch and makes for lots of space if that is your technique, or one you can fill. For my card, I decided to make a Father's Day card using the For the Boys set. I kept the color palette masculine and subdued. 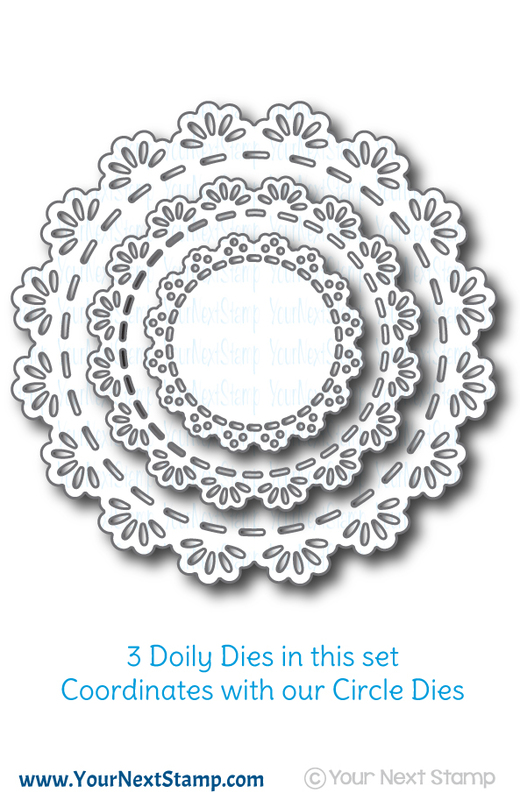 The image was stamped and colored with Copics before cutting out with the coordinating die and popping it up onto the center circle. 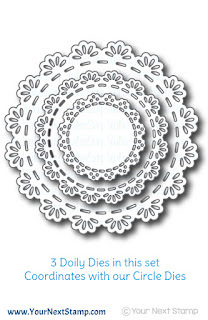 The circles were cut using the YNS Stitching marks die set. I stamped the beginning sentiment directly onto the main panel and the remaining sentiment at the bottom. The card was finished with some Love Earth gumdrops. We hope to see you beautiful creation linked up on the YNS challenge page and be entered to win a YNS gift certificate! Thanks so much for stopping by and have a great weekend!